The Best Steak Marinade you’re going to make this year is easy to put together and will take your steak to a whole new level! Starting with a good steak is key. I went to Whole Foods and picked up some steaks from the nice butcher there. And seriously, their butchers are really friendly. Like, I feel important when I buy meat. Which is weird. But still. Now, if you’ve been hearing about dry-aged meat, but aren’t sure what it is or why you would want it, let me tell you! Steak (and other meat too) is aged for 14-21 days (at least it is at Whole Foods). Temperature and humidity controlled during the aging process, which concentrates the steak’s natural flavor while reducing the moisture content. Enzymes break down the fibers on a microscopic level, which makes it more tender. These steaks will cook a little faster though, so monitor the internal temperature! 130-135° for medium rare. 140-145° for medium. Okay, now that the science-y stuff is out of the way, let’s cook! A little trick I picked up from Alton Brown is to let the meat rest after searing on a small, inverted plate placed on top of a large plate. This will let the juices drain away from the meat, preserving the beautiful brown crust that the searing gave it. I either pour the juices back onto the steak when I serve it, or pour the juices into a small bowl so I can dip each bite of steak as I go. Add all ingredients to a blender a process until thoroughly combined. Pour over steak and marinate for 2-8 hours. 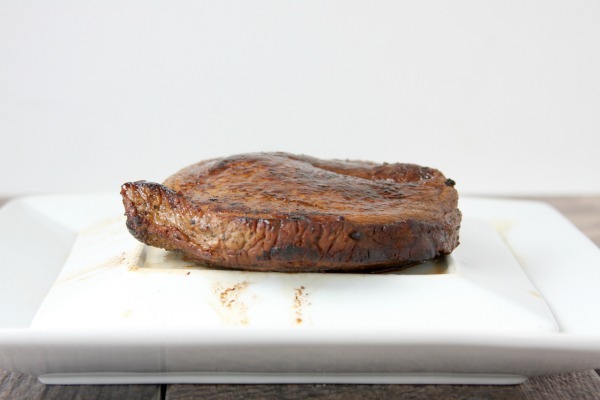 Allow steak to come to room temperature before cooking. 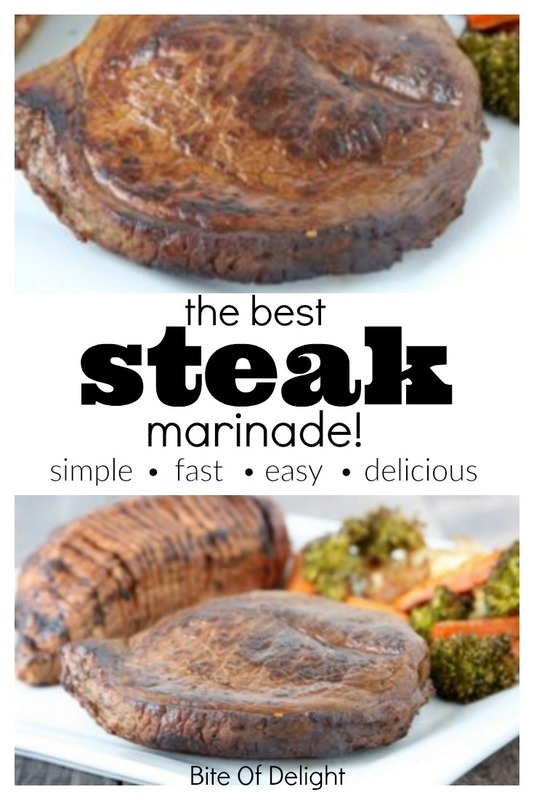 Remove steak from marinade and rinse. Pat dry with a paper towel. Cook as desired (see note below). 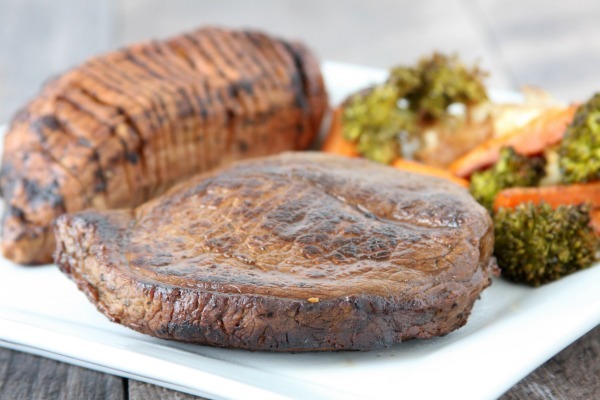 Steak can be cooked a number of ways, including grilling and broiling. I usually use the sear then bake method (use your cast iron pan for this one!) or sometimes the reverse sear method from Hey Grill, Hey. I found an awesome infographic for you about matching cooking method to beef cuts. Follow me on Pinterest while you’re at it! Because food is my favorite. So let’s be friends! Use a high quality balsamic vinegar. I bought what I thought was a good one off the grocery store shelf one time right before I taught a class, because I had just run out of my usual vinegar. It wasn’t very good balsamic and the food I served at the class wasn’t nearly as good as usual. And I felt dumb. Learn from my sad mistake. I use Bragg Liquid Aminos instead of soy sauce. 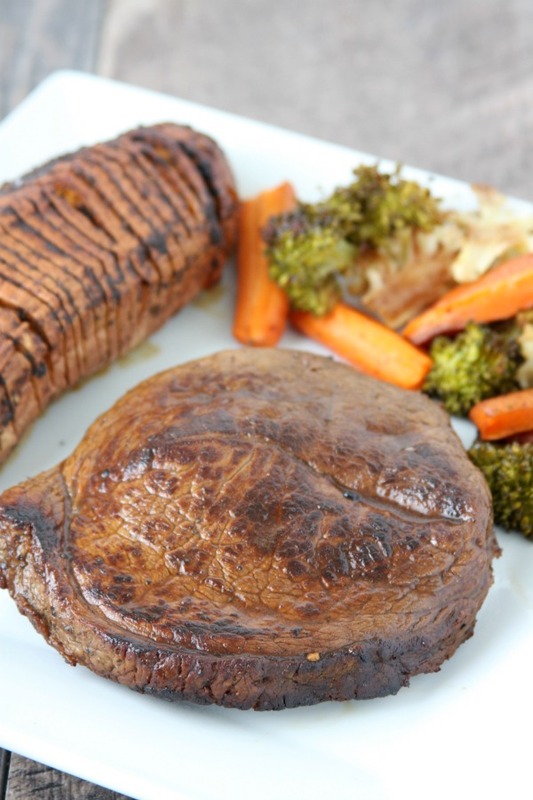 For another great recipe, try this herb roasted lobster & steak from Whole Foods! I am a Whole Foods Blogging Ambassador. This post was written in exchange for a gift card to purchase food. All opinions are my own. Thanks for supporting this site! For a PRINTABLE version of this recipe, click NEXT!